We specialize in producing excellent quality master's academic regalia for all your academic requirements at excellent quality and affordable pricing using high quality fabrics and craftsmanship. 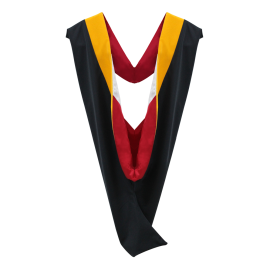 The academic master's hoods are elegantly made to accomidate your essential MA degree dress code for your special graduation ceremony. When placing your academic hood order with Gradshop it is custom tailored to your academic requirements at a reasonable time frame. Take advantage of great savings and view our selective options of ordering the master's degree gowns individualy or select to order our master's degree cap and gown packs at great low prices consisting of master's caps, gown and academic tassel. Check out your options and place your order today for great savings.